Our History | Everybody Wing Chun LLC. Wing Tsun is a Chinese martial arts system. Legend says it originated in the historical southern Siu Lam (Shaolin) Monastery. A Buddhist nun by the name of Ng Mui was an elder in the monastery. During the reign of Yung-Cheng (1723-1736) there was a fire at the monastery during a siege by government forces. It was said by stories spread by the Triads that the siege was led by high officers of the Manchu government and helped by defectors of the monastery. The nun and several others escaped. The nun was later inspired to develop her own system, a departure from the original martial art of Siu Lam. 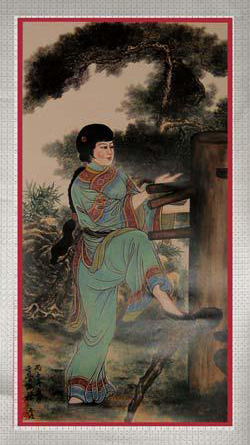 She later passed this knowledge on to another woman, Yim Wing Tsun for whom the art was named. This began a long line of succession until late Grandmaster Yip Man learned it from Chan Wah Shun in the first years of the 20th century. Yip Man began teaching Wing Tsun (Chun) in Hong Kong in the 1950s after he fled the communist takeover. Yip Man had many students but the core was said to have been only about sixteen. The young master Leung Ting was invited to teach in the United States by several persons in 1978-1979. One of them was Keith Sonnenberg, already a student of the art in another lineage. From this invitation it came to be that Sifu Keith Sonnenberg became Leung Ting’s first American student. Sifu John Brusstar came under Sifu Sonnenberg’s instruction in 1995 in classes at Mesa Community College. You can read Sifu Brusstar’s complete biography elsewhere on this site.